In 2011, the flagship HMV store in Shibuya, Tokyo closed its doors forever as the vast majority of music consumers in Japan now purchase and listen to digital music via mobile devices and computers. 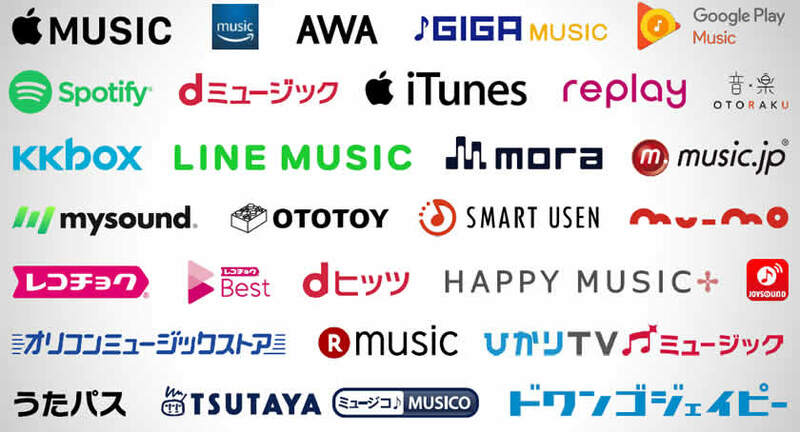 In today's music business, distribution means getting your digital music products into the main digital download and subscription service providers in Japan, such as iTunes/Apple Music Japan , Amazon Japan, Google Play Japan, Spotify Japan, AWA, Line Music, etc. According to the data published by the Recording Industry Association of Japan (RIAJ), almost 44 billion YEN's worth (about US$385 million) of digital music sales were made in Japan in 2014. As a foreign indie label or artist, you can easily get your music on Tunes/Apple Music Japan , Amazon Japan, Google Play Japan, Spotify Japan, AWA, and Line Music by using a digital distributor such as CDBaby, TuneCore, ReverbNation, SongCast, etc. Songs and albums sold on iTunes Japan and Amazon Japan usually sell at a higher price than they do on iTunes USA (UK, Canada, etc.) because the Japanese YEN is stronger and market prices in Japan for music (and other things) are often higher than in other countries. To check if your album/song is on iTunes/Apple Music Japan, just replace the country code for "jp" in the iTunes/Apple Music link (as in the above example). Search for your music at some other music providers in Japan below. If not available at these places, ask your digital distributor if they can add your music to them. Then make sure to add the links to your Japanese web/mobile site to start getting sales from Japan. If you create a Japanese website at TopMusic.jp, they will search for your music at Japanese music providers and add the links for you. Of course there are other digital music providers in Japan. If you really want your music available at all the digital music providers in Japan, you can contract with a Japanese indie record label or use a Japanese digital music distributor. In either case, the label or distributor will take 35-50% of your sales and may also charge you distribution fees, translation fees, administration fees, and taxes. For foreign indies, iTunes/Apple Music Japan, Amazon Japan, Google Play Japan, and Spotify Japan are sufficient. Click for info about Japanese digital music distributor. Please note that in addition to downloads and subscription services, there is another digital music format for mobile phones in Japan known as Chaku-Uta / Chaku-Uta Full. These are proprietary music file formats compatible with traditional mobile phones (known as keitai in Japanese). They are typically purchased and downloaded via the mobile carrier network. A Chaku-Uta can only be used (technically and legally speaking) on the mobile phone to which it was downloaded. Chaku-Uta is a registered trademark of Sony Music Entertainment. The sales, technology and distribution of Chaku-Uta is highly regulated in Japan by the major phone carriers, record labels and rights administrators. Chaku-Uta are ringtones (and ringback tones). They retail for 80 to 120 YEN each. Chaku-Uta Full are full songs in "CD" quality. They retail for 210 to 410 YEN each. The first Chaku-Uta service was introduced in 2002 by KDDI (one of the big 3 mobile carriers in Japan). Between 2004 and 2006, all the carriers started introducing Chaku-Uta Full as mobile technology advanced. Recochoku (formerly Label Mobile) is the main Chaku-Uta content provider operated by a group of many of Japan's largest and most influential record labels. In general, to sell your music as a Chaku-Uta, you need a deal with a Japanese record label. In 2014, Chaku-Uta (ringtones and full songs) accounted for about 33% of all digital music sales in Japan as compared to 90% in 2008. This decrease was expected with the introduction and rise in popularity in Japan of smartphones, tablets and other portable devices with built-in WIFI and music players. Chaku-Uta sales have been dropping for the past few years. We expect this format to become insigificant in the near future. To distribute your music in Chaku-Uta format, you can contract with a Japanese indie record label or use a Japanese digital music distributor. In either case, the label or distributor will take 35-50% of your sales plus charge you distribution fees, translation fees, administration fees, and taxes. Unless you will be doing thousands of dollars of promotion in Japan and expect to sell thousands of Chaku-Uta, we feel it is not necessary for indie artists/labels to invest in this music format. The sales of CD's in Japan is virtually non-existent except for consumers age 40 and over. Nowadays, it is not necessary for foreign artists/labels to contract with a Japanese record label or distributor to sell CD's in Japan. Music sales are primarily digital and made online or via mobile carrier. If you do have physical products such as CD's, vinyl records, and other merchandise such as T-shirts, you can sell them directly to Japanese consumers from your Japanese web/mobile site.